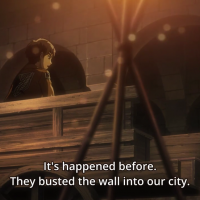 Attack on Titan Season 2 Episode 2 / Episode 27 was aired on April 9, 2017 and as expected, it was another episode full of action but not in a 3D Maneuver way. 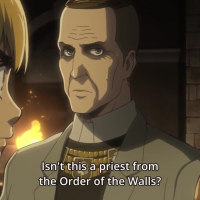 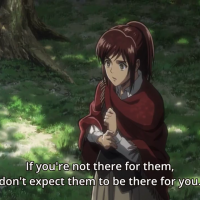 I’m talking about Sasha who returned home to warn the people in the village that the titans had broken into Wall Rose. 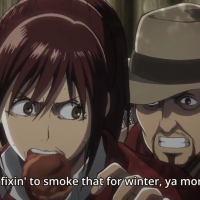 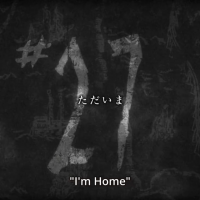 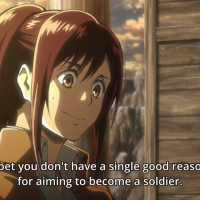 Based on Sasha’s back story, Sasha grew up in the woods hunting and her father later said that they have to give up hunting and start raising horses instead because the people from Wall Maria had moved into the villages of Wall Rose and food became scarce so people from Wall Maria had to go hunting as well, which made it difficult for everyone to get their food. 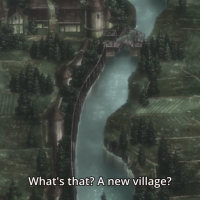 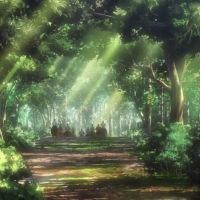 Upon reaching Sasha’s village, she noticed that almost everyone is gone but she discovered a new village deep in the forest. 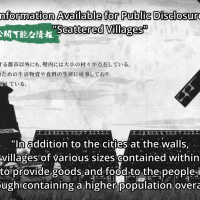 The secret village is almost a ghost town as well but she found a house where a titan is eating a woman and a kid is just there, staring (which is a very eerie image, I should say). 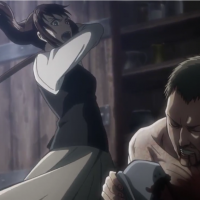 Sasha was able to save the girl but not her mother. 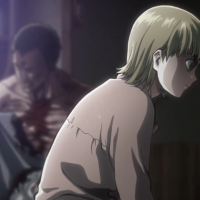 As what the child told her, her mother is crippled so everyone left them and she can’t do anything but just stare at her mother being eaten. 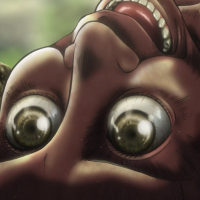 Connie was able to reach their town in the north and did not find anyone there, except for the somewhat deformed titan who looked like he fell on Connie’s house. 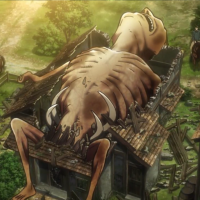 It was impossible for the titan to walk because his arms, limbs and feet are not proportional to his body and so small that he cannot carry himself around. 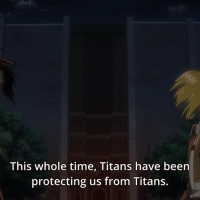 Another episode has passed and it seems that more and more questions are unanswered about the titans. 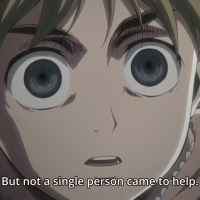 Also, if you wish to still feel all the excitement in watching Attack on Titan, avoid reading spoilers and the manga version. 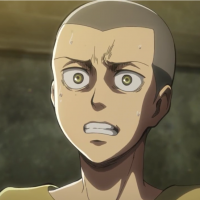 You’ll really appreciate the anime series if you did not read any spoilers.